Jared Kushner and Ivanka Trump with the art they made on a painting "date night" in New York, September 2015. Not that Halt is exactly expecting Ivanka to heed their call, given that their initiative has been almost as much of an attack against the first daughter as it is against the president, with protests outside her apartment and Instagram after Instagram on the group's account mocking Ivank's book, Women Who Work. Instead, Dear Ivanka has mostly served as a platform for artists whose works she owns—and those who are simply along for the resistance ride, like Marilyn Minter—to speak up about their discontent. 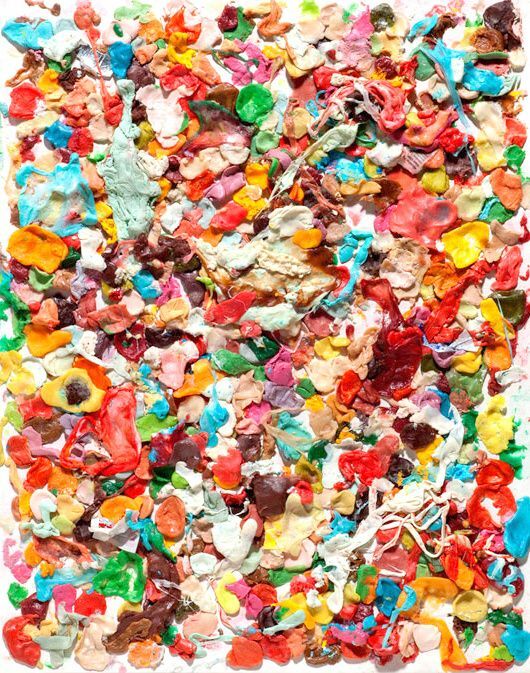 Dan Colen and Nate Lowman, for example, joined Dear Ivanka after their works appeared on the walls of Ivanka's apartment, and Alex Da Corte, who also joined up, let Ivanka know how he felt by leaving a comment on one of her Instagrams reading "please get my work off of your walls. I am embarrassed to be seen with you." Also reportedly among Trump and Kushner's purchases are a cartoonish mobile by Louis Eisner, as well as a painting by Christopher Wool that artnet News reports Ivanka actually used as an inspiration for a handbag in one of her collections for Lord & Taylor. Most enlightening about the pair's collection, though, are the choices in the artists it features: For all of Ivanka's supposed advocation of women, she sure doesn't seem to be a fan of any women artists.